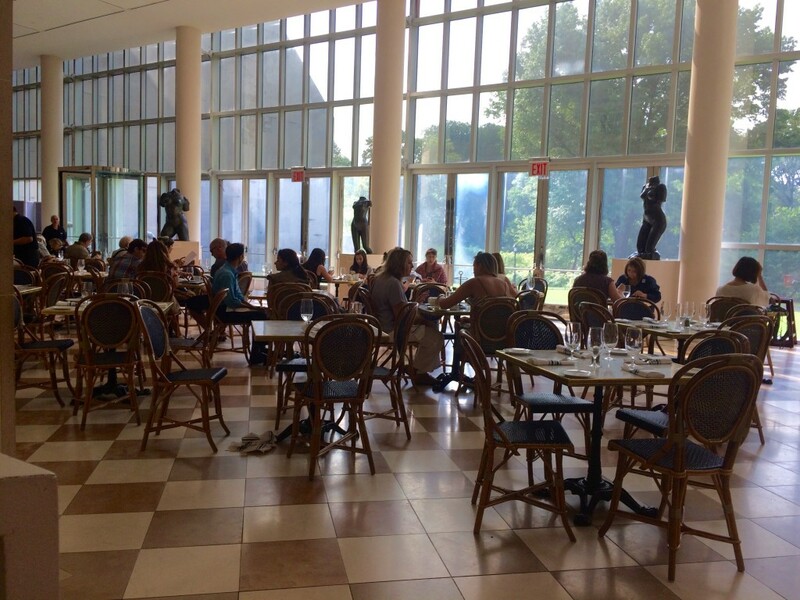 I felt slightly self conscious as I asked for a table for one at Petrie Court Cafe at the Metropolitan Museum of Art in New York City. I have this thing about going to restaurants alone. 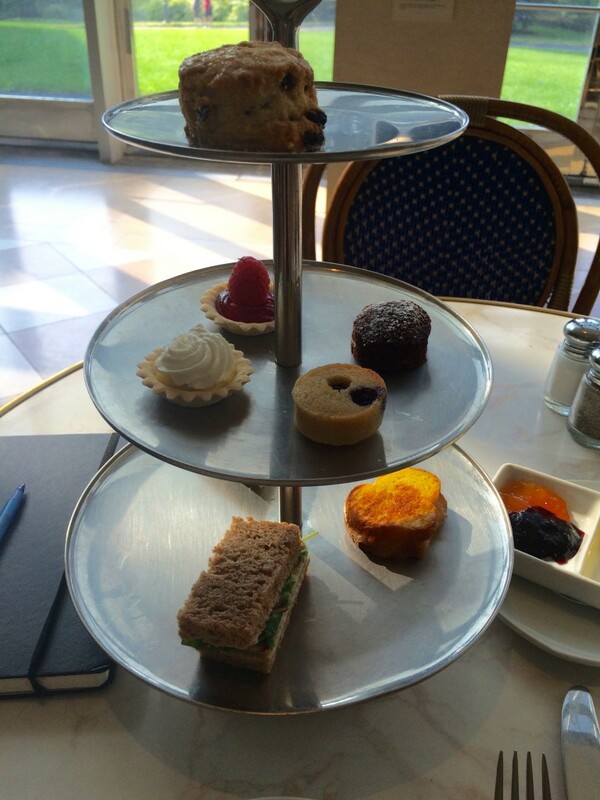 Especially for afternoon tea. That feeling has since subsided, on my first lone dining experience. But still. My schedule allowed for a few hours at the museum on a Friday afternoon. As I walked into the cafe, I noticed many other lone diners. And after my 45 minutes spent, I realized, these are the people that know how to enjoy life. The entrance to the MET is at 82nd Street on Fifth Avenue in Manhattan’s Upper East Side. 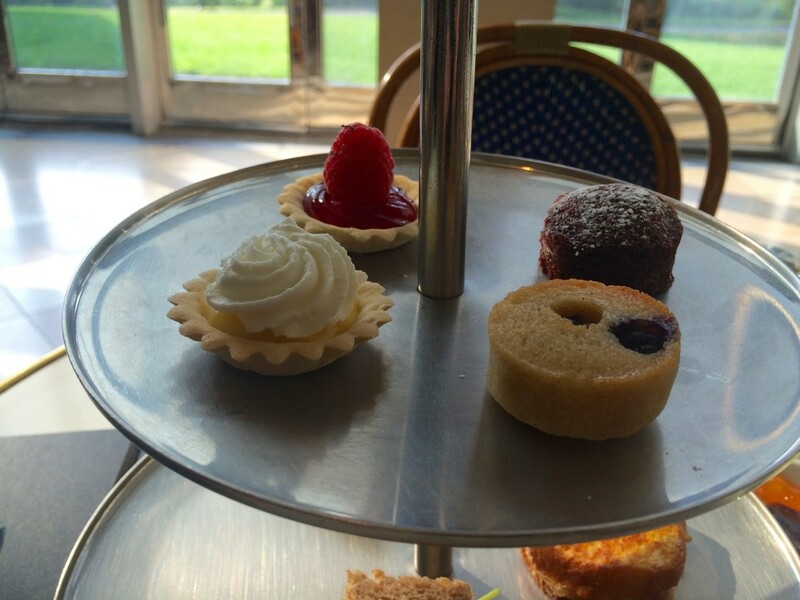 Specifically for afternoon tea, the Petrie Court Cafe is located by the European sculptures in an area called The Carroll and Milton Petrie European Sculpture Court. The court looks like it’s between two different buildings. And it is. The pinkish brick building was the entrance to the MET back in the late 1800s. During the late lunch and afternoon tea hour, Petrie Court Cafe looks inviting with the mid-afternoon sunlight flowing through the cafe’s floor to ceiling windows overlooking Central Park. 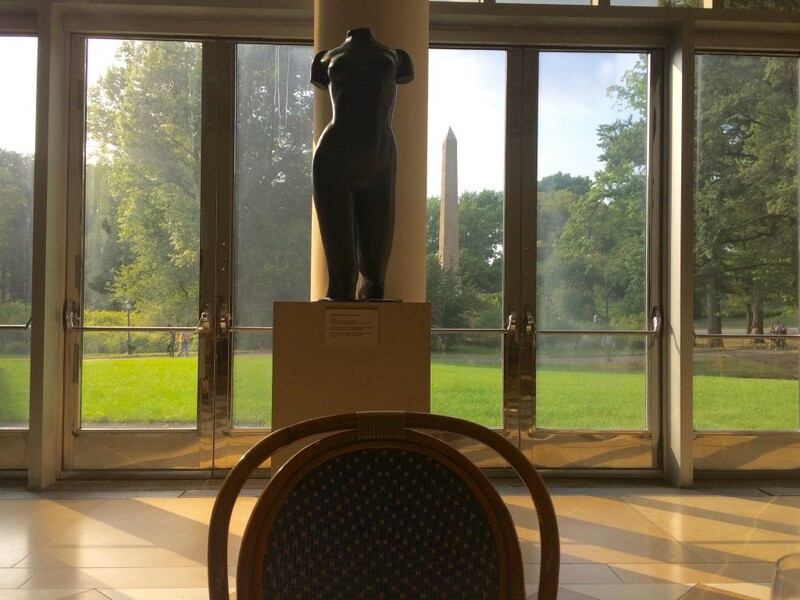 At a table by the windows, a monument appears among the green. The Obelisk is a landmark in Central Park, brought across the Atlantic Ocean from Egypt. 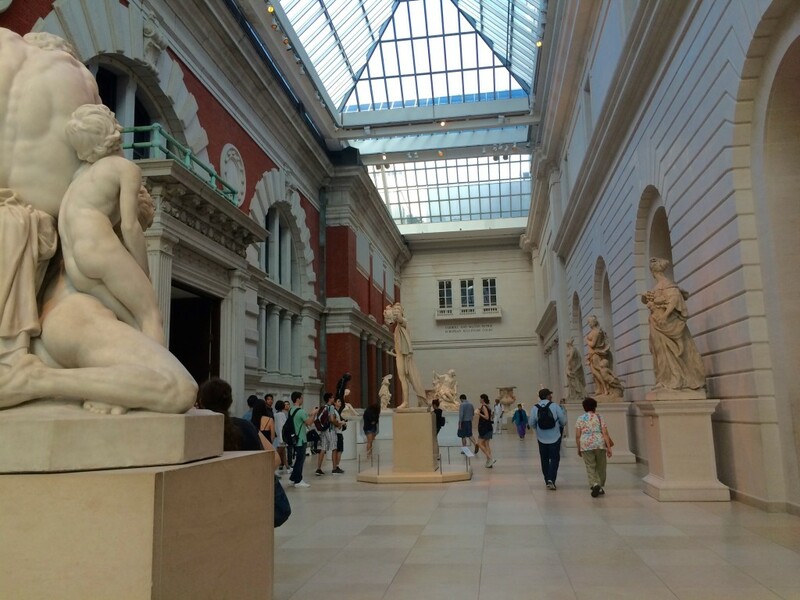 Back inside, on the other side of the windows, are sculptures of women’s torsos without heads. Lovely. Well, it is art. And it’s inside an art museum. 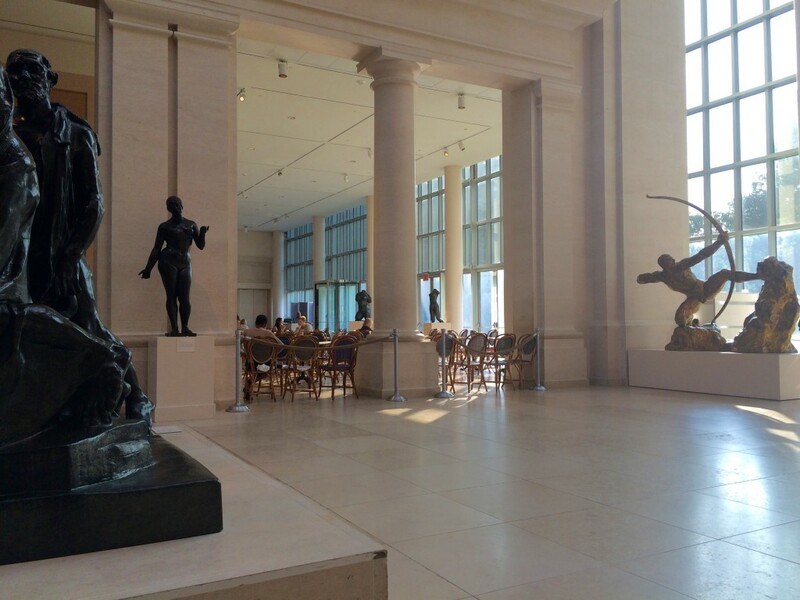 I sat right smack in front of Torso of Ile de France, by French sculptor Aristide Maillol in the 1920s. 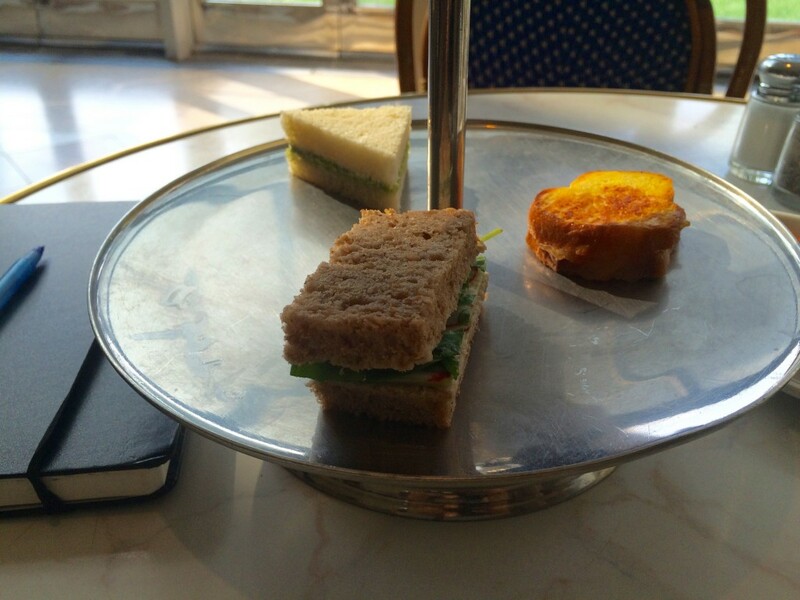 The ambience isn’t your usual hotel afternoon tea lounge. There’s no music playing, but instead a loud blend of voices. Tables are small, allowing for two but are close enough to just pull the neighboring table over to allow groups to be together. 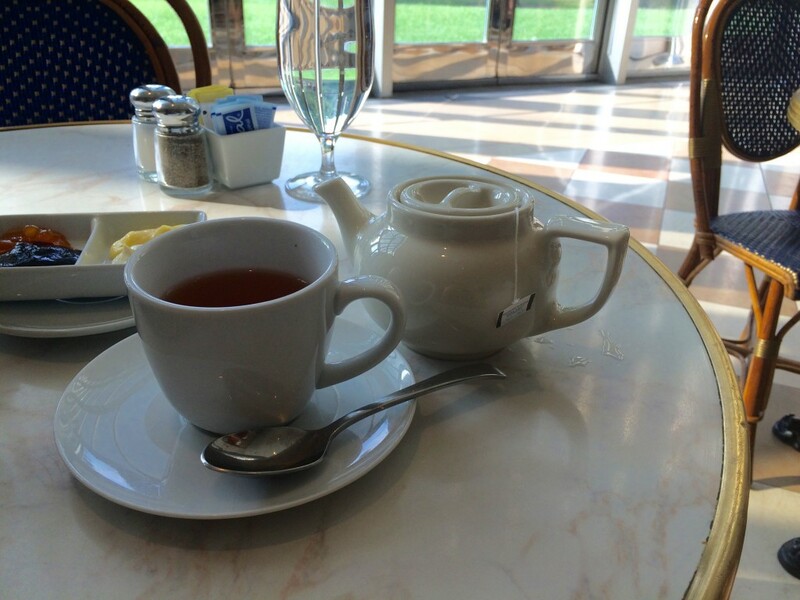 The Petrie Court Cafe offers a selection of Harney and Sons‘ black, green, and herbal teas. Teas aren’t served in loose leaf form, but in convenient satchets. The traditional afternoon tea package for $26 per person is reviewed here, though a package with sparkling rose wine for $35 per person is also offered. Included were a classic egg salad on whole wheat; sweet pea and ricotta on brioche; cucumber, radish, and salted butter on pumpernickel; and croque monsieur. A currant scone is accompanied by two flavors of jam (apricot and blueberry), clotted cream, and lemon curd. It was not served warm and was a bit hard and crunchy. 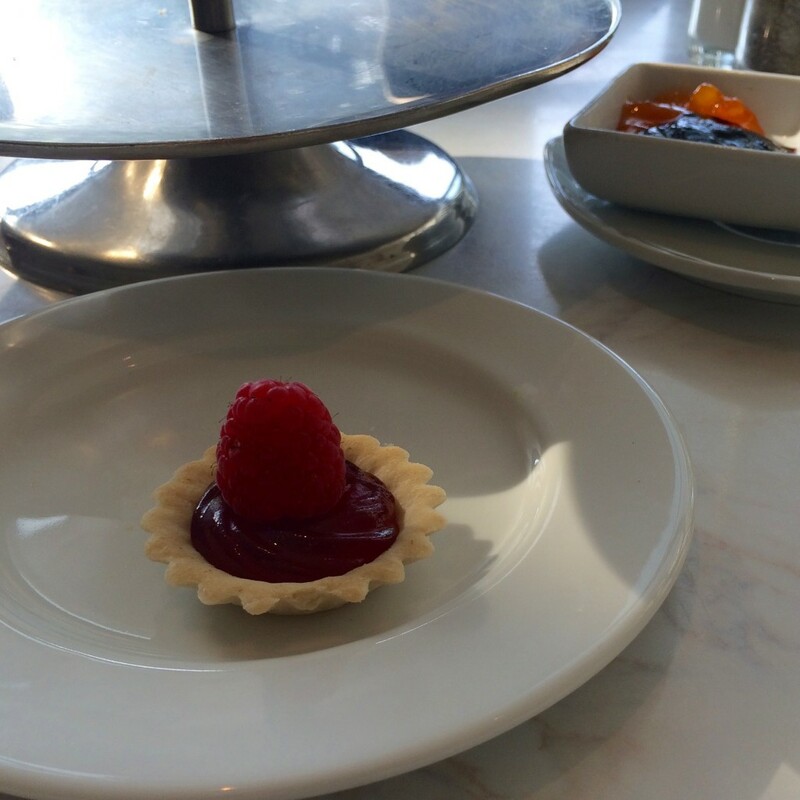 A lemon and a raspberry tartlet and two petits fours. Tea is served in a white ceramic tea pot, big enough for two cups of tea. There’s nothing too special about the standard restaurant white plates, cup, and cutlery. But I did think the tea pot was cute. Meanwhile, food is served on a traditional three tiered tray, which looked somewhat industrial-ish made of light weight aluminum. Service was like a regular restaurant, waiters are polite, friendly, asks how things are once or twice, and brings everything in an orderly fashion. I have no complaints. The cafe does not have individual social accounts though the MET does and actively posts on all platforms. Just don’t expect a reply on anything as they have millions of followers and fans. 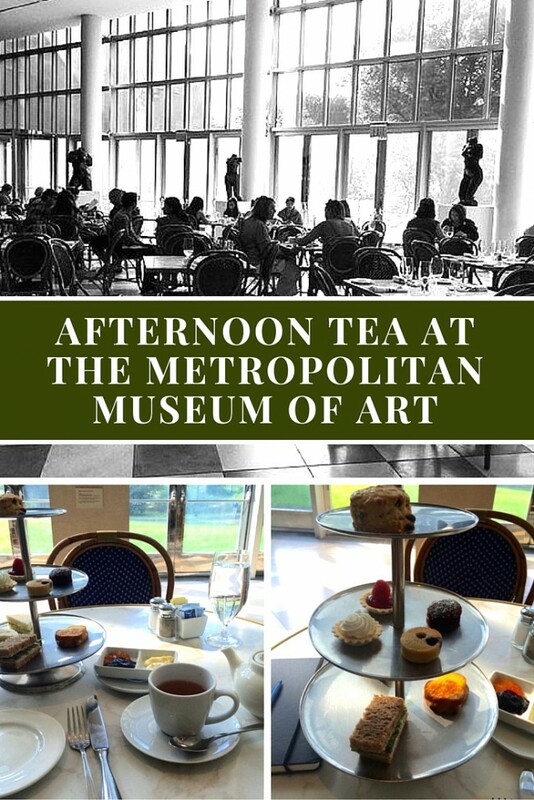 Afternoon tea at the Metropolitan Museum of Art does not have the usual hotel lounge environment. Food was honestly not to my liking at all and isn’t worth the price. 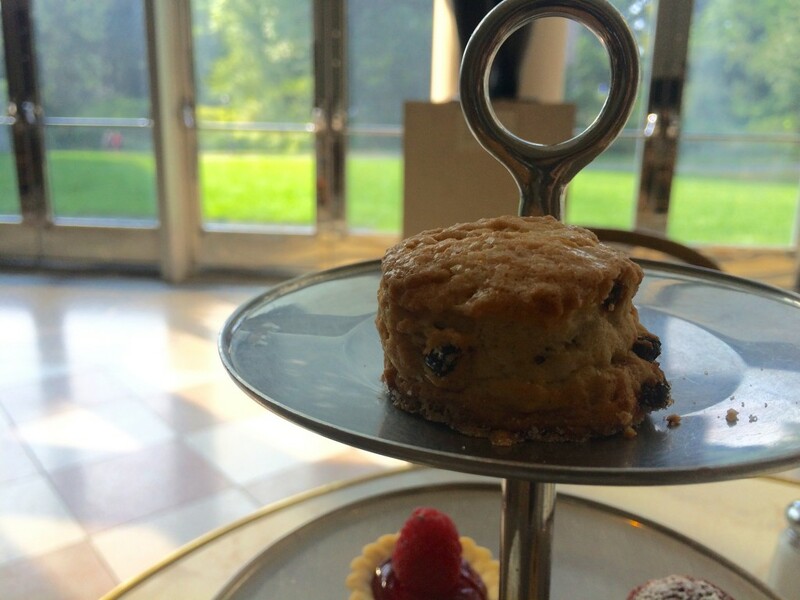 But if you’re spending a day at the MET, take a break at the Petrie Court Cafe. 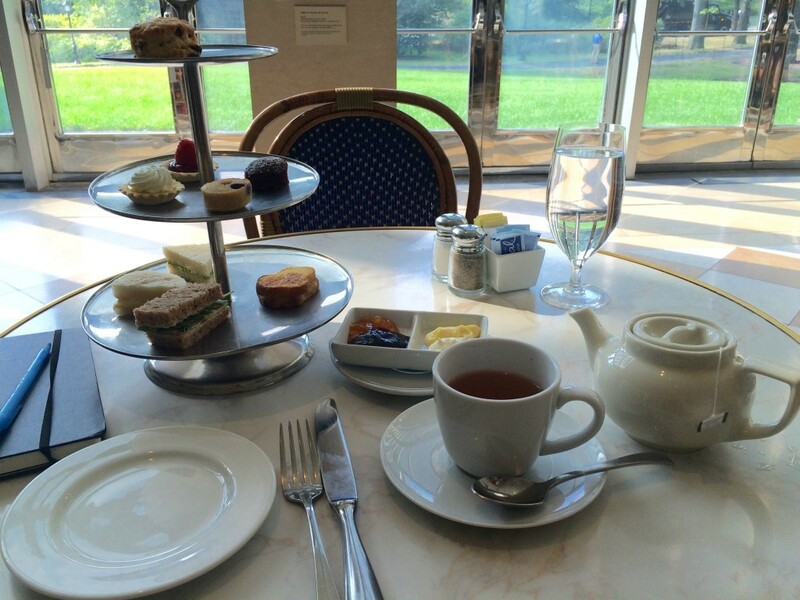 Skip the afternoon tea package and instead, order tea and ask for a seat close by the windows.